How much teasing can Shanice take before she shuts herself away from the ones who love her most? A story about race, true friendship and God's love. Ages 13+. 144 pages each. [Shanice Stevenson is a great singer - so good that she once sang lead for the talented garage band she and some friends have successfully pulled together. But when beautiful, blonde Jenna Rose Brinley takes over as lead, Shanice is content to step out of the spotlight - that is, until her cousin moves in. Tonya, troubled by a family divorce, teases the biracial Shanice about her lack of black friends and convinces Shanice that her replacement as lead singer was due to race. Soon, Shanice rejects her friends from the band - until in a time of crisis, she finds nowhere else to go. Relevant and current, The Backup Singer shows teens that God's love and true friendship can resolve the tensions of society. 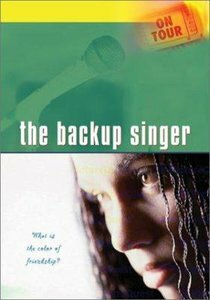 About "The Backup Singer (#02 in On Tour Series)"
Shanice Stevenson is a great singer--so good that she once sang lead for the talented garage band she and some friends have successfully pulled together. But when beautiful, blonde Jenna Rose Brinley takes over as lead, Shanice is content to step out of the spotlight--that is, until her cousin moves in. Tonya, troubled by a family divorce, teases the biracial Shanice about her lack of black friends and convinces Shanice that her replacement as lead singer was due to race. Soon, Shanice rejects her friends from the band--until in a time of crisis, she finds nowhere else to go. Relevant and current, The Backup Singer shows teens that God's love and true friendship can resolve the tensions of society. Barb Huff is the author of On Tour: The Perfect Girl and On Tour: The Back-up Singer. A former youth and children's ministry director, she has published devotionals on parenting and teen nonfiction articles in Guideposts for Teens and Group. She and her family live in Ohio.